My week captured thru my camera, un-filtered & un-retouched. Oskar wondering the the returnables are going to topple onto him before JD cashes them in. Snow. 15 inches this time. Some delicious Cowgirl Chocolates that I won from Doggies & Stuff. They're truffles and caramels spiced with cayanne, jalepenos and habaneros. Too hot for me, but Chris loved them. Pajama outfit of the week. I named the bear on these PJ's Oliver cause he's "all over" the jammies! I fell asleep early cause I was feeling bad & this is what I woke up to in the morning. Accidental Silly Putty creation. I can't put this stuff down! A beautiful Voluspa Pink Citron candle from Apothica, my new sponsor. Pink grapefruit with cassis and rose, it rocks! I'll have a review and giveaway coming soon, so stay tuned. CSN Stores Review Amazing Duvet Cover! I was lucky enough to work with CSN Stores again and I got an amazing duvet cover. The Wildon Home 400 Thread Count Hem Stitch Solid Sateen Duvet Cover Set has exceeded my expectations in every way! It's 400 thread count cotton sateen and it feels like heaven! This is the detail around the duvet cover and the matching pillow shams that are included. The color I chose was Willow, & it's beautiful. I'm happy to say that there are buttons on the bottom. I've had duvet covers with both snaps and velcro and both of those disappointed me. These buttons arent's huge and are nicely spaced across the bottom to keep your comforter securely in place. I'm glad to report that it washes up well, which we need with a dog & 2 cats sleeping on our bed with us. My husband has raved about this duvet cover since it arrived. I honestly both think we get a better nice sleep with this on our down comforter. Oops, I almost forgot to mention the beautiful pillow shams that came with the duvet cover. An extra added bonus! My PJ outfit of the week. Gotta love my color and pattern choices, don't you! 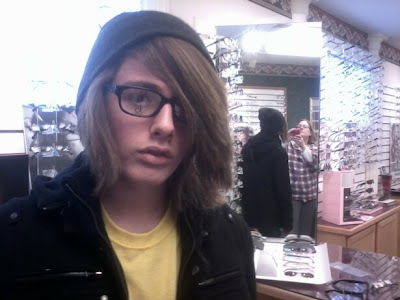 Jack got his first pair of glasses. I love these, they are just so "Jack"! Oskar walking in the snirt. That's snow + dirt for you in the warmer climes. Oskar helping John David. John David was not paying attention! I got a new season of NCIS today. Best. Show. Ever! 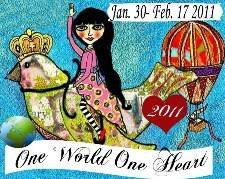 One World One Heart 2011 Winners! Thank you to so many of you who came and visited during OWOH 2011. I love the way these images look. 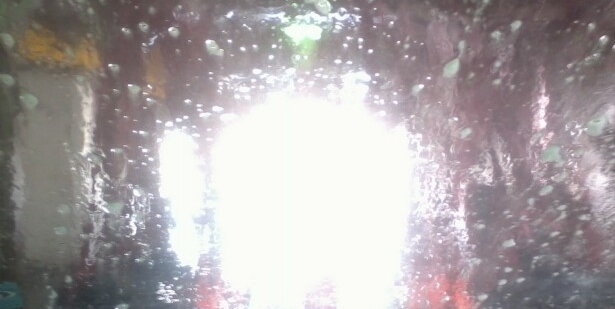 I took them while driving through the car wash. 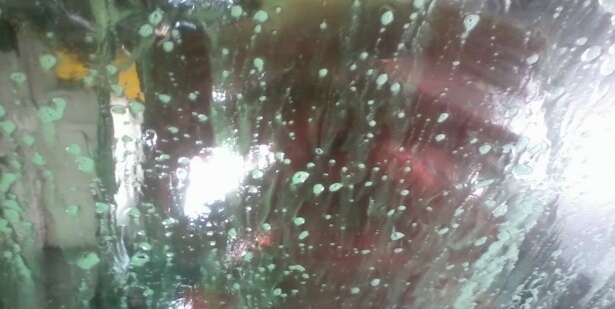 They make me feel all artsy-fartsy, lol! Moe is our elder cat and doesn't get too much attention. She prefers to keep to herself and sleep her days away, snoring loudly I might add, but on Sunday she demanded some one on one time with Chris. I got 10 free Shutterfly cards, so I had Valentines made up for Oskar to send to a few of his lady friends. He's quite the ladies man. John David got me a giant blue monkey for my birthday last July. I walked in to find him placed here. Subtle, huh? I returned to my psychiatrist after trying a different doctor for a while. It was great to see him & as I walked into his office he was just hanging up this calender. 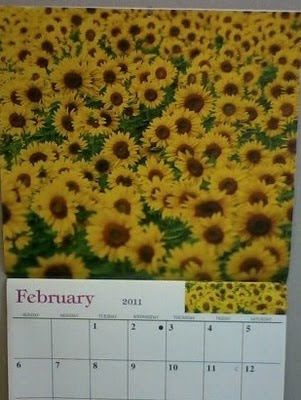 Sunflowers are my absolute favorite, so this seemed like such a great omen! $644.00 worth of wisdom teeth that John David had removed. ﻿﻿That's out of pocket and we have great insurance! I can't imagine what people do without insurance. He was really out of it for the first day, but he's doing great now. ﻿Oskar, King of all pillows within his reach. He worked hard to make that mound and spent his afternoon happily surveying his back yard from his perch. ﻿Am I really that boring? Everyone in the room fell asleep. If you look you'll see 2 cats, 1 schnauzer and one exhausted husband. ﻿﻿Here's hoping that all of you have a great week! Hop on over to Sara's blog to see all the other Project 365 players. I'm lucky enough to work with Build A Sign and they have offered me a wonderful giveaway. Fire safety window clings for your pets. You just fill in the blanks with a permanent marker to alert the fire department to the number of pets in your home. I have 10 of these wonderful window clings to give away! All you have to do is send me an e-mail at hoerauf at comcast dot net, with your mailing address. Because I am paying the shipping costs myself, I'm sorry to say that this is only open to US residents. These signs could help save your pets life in case of a fire, so shoot me off an e-mail right away. Thanks again to Build A Sign for making this giveaway possible! ﻿﻿Oskar posing for his Valentines day card. We got some free cards from Shutterfly, so Oskar is sending them to some of his blogging lady friends. 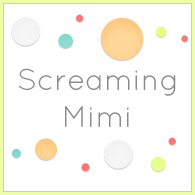 Yes, Oskar has his own blog. ﻿Not a picutre I took, but I want everyone to know about the 5th and final One World One Heart event. Hundreds of bloggers from all over the world connect and get to know each other while offering small door prizes at every stop. It's really magical and I'm so sad that this is the last year. There's still time for you to join in! My new purse, it seemed nice & springy to me! ﻿﻿Yep, snow. After listening to the weather forecasters yowl about this storm, we got 9 out of the expected 18 inches. I know it's worse in other places, but people, this is Michigan. It snows here. Every single year. Enough with the hysteria. Love me some Duds! They helped get me through the night. ﻿﻿Jack arriving home from the mall, having no choice in whether or not I take his picture! I'm having a little anxiety about this P365, since I see so many pictures of people out and about, at parties, with friends, at church. It makes my life feel so small, but it's a real look inside the life of me, living with my issues. Most of my life takes place in my small house and for now that just has to be OK with me, I guess. ﻿It's not to late to join Sara for Project 365!